If you have good portfolio of property just go for it. If you purchase the product at a â€˜Buyout price' it guarantees that you are the last person to buy this template from us. It means that this WordPress design for Immovables may have been sold before a couple of times (see â€˜Downloads' number in item's properties) but only you and people who bought the template before you will own it. After this kind of purchase the template is being permanently removed from our sales directory and is never available to other customers again. The buyout purchase license allows you to develop the unlimited number of projects based on this template, but the template should be customized differently for every project. If you purchase the product at a â€˜Unique price' it guarantees that you are the first and the last person to buy this WP theme for Estate Agents from us. It means that this template has not been sold before and you become an owner of a unique design. After this kind of purchase the template is being permanently removed from our sales directory and is never available to other customers again. The unique purchase license allows you to develop the unlimited number of projects based on this template, but the template should be customized differently for every project. It is very use to use and also easy to install, the layout can be customized as per need. If you need a template for your real estate business, you will find it to be good. Just what the client ordered. 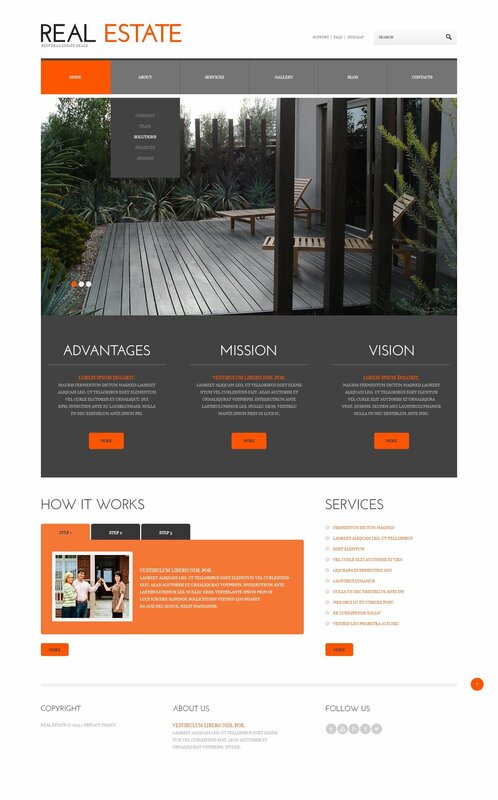 The client, a commercial property developer asked that the website reflect their existing corporate profile. I was easily able to change the fonts and colours to match those of the clients and the smile on their face was evident all is good. As a web developer that specialises in helping small businesses gain a credible online presence I find the product and quality of support from Template Monster to be outstanding. It certainly makes my life easier and helps me keep my clients happy. Now on to the next one. ...and in web design that&#039;s exactly what I want, to get what I&#039;m expecting. Simple and straightforward to install and it looks exactly as I anticipated. The files are organized and named in a way that makes everything easy to find. Categories are organized in a logical way that makes everything easy to locate and allows the site to function beautifully. Code is clean which makes for super simple changes to the CSS. I will be using template monster exclusively for all my clients&#039; template-based sites. This is a nice template. It is fairly robust and customization has not presented much of a difficulty. I would use this template again. How do I change the photos on a gallery post with multiple photos?